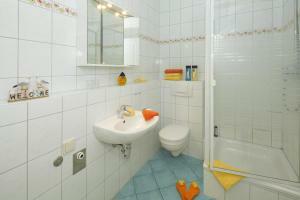 These apartments are located 50 metres from the beach promenade at the Baltic Sea resort of Seebad Ahlbeck. The Ahlbeck pier is just 6-minute walk away from the accommodation. Decorated in warm colours, the bright, spacious apartments comes with a satellite flat-screen TV, a private bathroom and some include a terrace. Guests can prepare homelike meals in the kitchenette, which include a stovetop. There is a variety of dining opportunities within 2 km. Baltic Sea Resort Heringsdorf, Lake Wolgasee and the Polish border are all situated within 4 km from Strandvilla Ostpreußen. A beach basket and bikes can be rented at the property. Guests will be contacted by the hotel after the reservation has been made regarding payment and picking up the keys. The bank details for the deposit will be sent in a separate email. Please contact the villa in advance should you wish to arrive after 18:00. Guests receive a 50% discount on the entrance fees to the Ostsee-Therme "Usedom" Spa Baths (not applicable on already reduced rates). Please be aware that are closed for maintenance 14 days every January. Please contact the Spas if you are planing a visit in this period for more details. 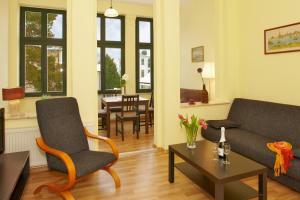 Please note that the check-in and key-collection take place at: Aparthotel Strandhus, Schulzenstraße 8a, 17419 Ahlbeck. Please inform Strandvilla Ostpreußen in advance of your expected arrival time. You can use the Special Requests box when booking, or contact the property directly with the contact details provided in your confirmation. Payment before arrival via bank transfer is required. The property will contact you after you book to provide instructions.